Netflix is moving forward with some pretty anime-zing new projects. The streamer has put into development five anime series — including ones based on Guillermo del Toro's 2013 sci-fi monster movie Pacific Rim and the Netflix original dystopian cyberpunk series Altered Carbon. Deadline had the full details on the upcoming Pacific Rim and Altered Carbon anime series, as well as information about three others coming to Netflix – Cagaster of an Insect Cage, Yasuke, and Trese. The Pacific Rim anime will further explore the world in which the original film and its Steven S. DeKnight-directed sequel Pacific Rim Uprising are set, bringing the action and narrative focus back to the Kaiju-versus-Jaeger battle. But the series won't simply be a reworking of the first two Pacific Rim pics in animated television format. Instead, it centers around brand-new characters — a pair of siblings, described as "an idealistic teenage boy and his naïve younger sister," who are searching for their missing parents. When the duo come across an abandoned Jaeger, an enormous robotic machine that's controlled by two people who link up in a stress-sharing process called "Drifting," they realize they must pilot it to increase their chances of locating their lost loved ones. But the "hostile landscape" across which the siblings will have to travel poses a great danger to their safety and survival — and a massive threat to the potential success of their mission. Legendary Entertainment, the studio behind Kong: Skull Island and Detective Pikachu, produces the series, which has Thor: Ragnarok writer Craig Kyle and X-Men: Evolution scribe Greg Johnson attached as co-showrunners. As for the Altered Carbon anime, it too takes place in the same universe as its live-action counterpart. Less is known about the Altered Carbon project than is about the Pacific Rim one, but it's said that the overall plot will "explore new elements of the story mythology" — which centers around a prisoner named Takeshi Kovacs (a.k.a. Elias Ryker) who awakens after spending 250 years on ice and whose only chance at true freedom will come after he solves a mind-bending murder. Joel Kinnaman, Byron Mann, and Will Yun Lee top-lined the first season of Altered Carbon, set star Marvel Cinematic Universe actor Anthony Mackie in its upcoming second turn. Dai Sato (Cowboy Bebop, Samurai Champloo) and Tsukasa Kondo (Hodo Buzz, The Misadventures of Incredible Dr. Wonderfoot) are on board to write the Altered Carbon anime, hailing from animation studio Anima. Set in a post-apocalyptic world 30 years after the total decimation of humanity, Cagaster of an Insect Cage chronicles a young couple as they fight to stay alive and evade the horrifying disease known as "Cagaster," which transforms humans into killer insects. Gonzo, the animation studio that rolled out Hellsing and Afro Samurai, is behind Cagaster of an Insect Cage. Full Metal Panic! and Last Exile's Koichi Chigira will direct the series. Sorry to Bother You fans will want to tune into Netflix's fourth new original anime series Yasuke, as Lakeith Stanfield will lend his voice to the title character — a "retired ronin who must take up his sword when he is charged with the task of transporting a mysterious child who dark forces want to eliminate." Based on the real-life Yasuke, a Samurai of African origin who served Japanese warlord Oda Nobunaga in the early 1580s, Yasuke has The Boondocks and Cannon Busters' LeSean Thomas attached as director and executive producer. Thomas is also credited as the anime's creator. Grammy-nominated multi-genre music producer Flying Lotus is set to compose the music for Yasuke. And finally, Netflix is also working on Trese, an anime set in an alternate Manila in which humans and fantastical Philippine folklore creatures live alongside one another — though the latter stays in hiding. The series, which adapts the Philippine horror-crime "komicks" of the same name written by Budjette Tan and illustrated by Kajo Baldisimo, follows a young detective named Alexandra Trese, who dives into a "criminal underworld" and soon faces off against a slew of "malevolent supernatural beings." Jay Oliva (Wonder Woman, The Legend of Korra) executive produces Trese, which is produced by Shanty Harmayn and Tanya Yuson of Jakarta and Singapore-based company BASE Entertainment. These five forthcoming anime series come as part of Netflix's increasingly forceful push into original content that will appeal to a wider range of subscribers — especially those in Asia and those interested in Asian content, as "more than half of Asian content hours viewed on Netflix this year are viewed outside the region," according to Netflix CCO Ted Sarandos. Honestly, these projects sound incredible, but the Pacific Rim project in particular carries substantial weight in regards to the cinematic world from which it stems. Netflix creating a Pacific Rim anime genuinely couldn't come at a better time. 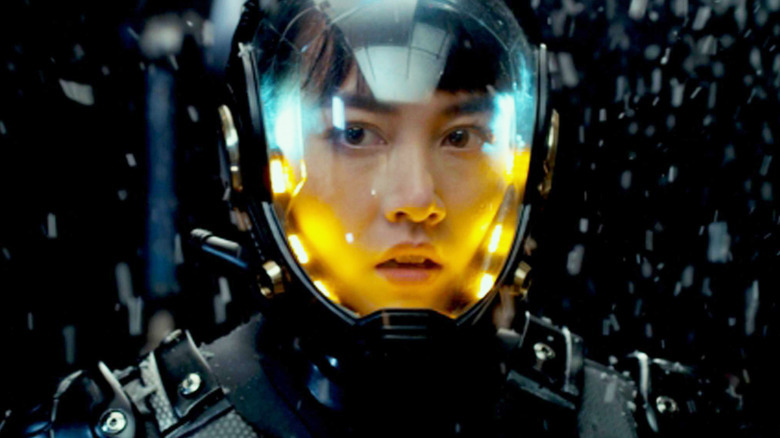 Since Pacific Rim Uprising failed to cause an uprising of its own at the box office(or amongst critics and fans) and because Legendary Entertainment brass hasn't yet mentioned any set-in-stone plans for a third installment in the franchise, an anime series set in the Pacific Rim universe offers a chance to bring the franchise back into good graces and keep it alive until proposals for a possible Pacific Rim 3 start to take shape. And really, who wouldn't want to see giant, human-powered robots fighting against colossal monsters? People who, we don't know, eat cardboard and think the worst movies of 2018 are actually the best ones — that's who. Netflix hasn't confirmed when Pacific Rim, Altered Carbon, Cagaster of an Insect Cage, Yasuke, or Trese will be available to stream. We'll update you with release dates as soon as the streamer makes the announcements.